Most of us are familiar with basic table manners. When it comes to office events, however, decorum is everything. These events are often a wonderful way to connect with co-workers and interact with the power players, but they can also be monumentally disastrous without modern manners. Don't become too comfortable because you cross the boundaries of professionalism. Here are a few tips to enjoy your after-hours office events while remaining professional. Sticking your nose to the grindstone can really pay off, but don't forget to relax. Your office culture determines the attitudes and dynamics at play in your office. Geography, tenure, written and unwritten policies can determine what is deemed appropriate in your workplace. 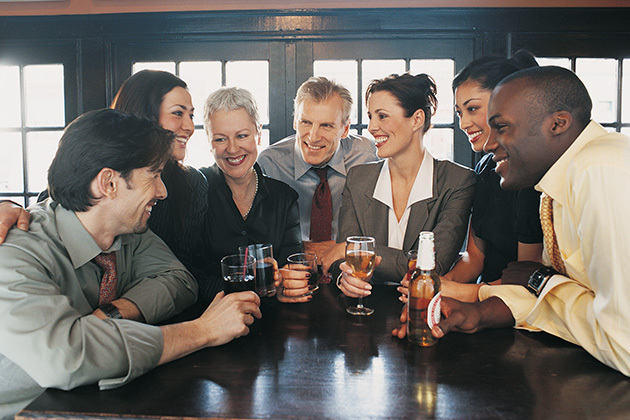 Factors such as alcohol can play a role in the social culture in the office, too. Ask around to colleagues you trust to find out the real scoop on office dynamics. Never assume. Remember to relax, keep professionalism in mind and be yourself. This is not your personal happy hour. Men and women alike, take note that a work party is an extension of the professional work day and is still a business setting. Dress sharply and clean cut in an outfit that helps you feel confident in yourself. While you engage in conversation, have a drink and channel your sophisticated self, but ultimately take this opportunity to relax. There is always the go-to topic when surrounded by colleagues: work. Keep dialogues balanced between professional and personal with classy, informative and interesting conversations. Asking questions about sports, movies, books, vacation, travel and pets are good topics that focus the conversation on others. By connecting with multiple colleagues from all areas of your organization, you create possible mentors, references and contacts that can help your career down the line. Remember, avoid sensitive topics like money, politics and religion. When attending a work event, have a goal in mind. If you are gaming to climb the ladder, visit with leadership and the head of the department for a few minutes. Sometimes you want to just talk to a specific superior, make new friends or expand your network into other departments. This is a professional gathering and a chance to put your best foot forward. Certainly enjoy the good food, a drink and interesting conversation, but don't lose sight of your main objective. Although being comfortable at these events is key, don't allow yourself to be overly comfortable. These events are an ideal avenue for colleagues to get to know you beyond work. However, keep in mind that there is a thin line between sharing happy stories about your personal life and divulging inappropriate information. Also, do not assume because there is an open bar that you need to consume alcohol. Always feel free to order a water, soda or drink of your choice. What you are drinking is irrelevant. The key is to engage in conversation in a professional and comfortable environment. Modern manners are necessary when navigating the waters of work events. Don't be afraid to enjoy these casual events outside of the office, but know your limits and always maintain professionalism. A cross-cultural consultant, business etiquette expert and best-selling and international award-winning author, Sharon Schweitzer is the founder of Access to Culture. She has built a career around understanding cultural differences and the tremendous role they play in building strong and successful international business relationships. Sharon is accredited in Intercultural Management from the Hofstede Centre in Finland, and she attended the Protocol School of Washington.